Seat Sandal appears on the left and the slopes of Fairfield on the right, and in between, Dollywagon Pike, Nethermost Pike, Helvellyn and a glimpse of Catstye Cam beyond Striding Edge. 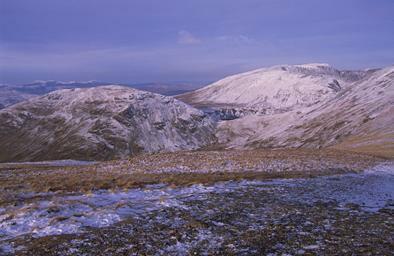 The northwestern fells of Grasmoor, Eel Crag, Hopegill Head and Grisedale Pike appear on the horizon on the left. Larger version of this picture.